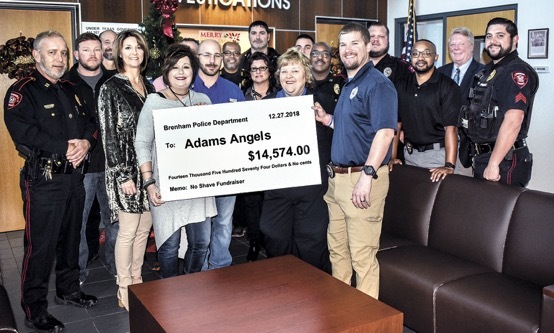 The Brenham Police Department on Thursday, December 27, 2018, presented a check for $14,574 as part of its annual "No Shave" Fundraiser benefiting Adam's Angels. The fundraiser raised $7,287, which local attorney Robbie Gail Charette matached. Pictured are Donna Culliver, founder of Adam's Angels Ministry, Charette, Heather Thielemann, and members of the Brenham Police Department.